A secure, exclusive boutique style apartment featuring large living areas, an indoor heated pool, spa, sauna and gym. The apartment is suited for couples, business travellers, and families (with kids). Make yourself at home in this renovated and contemporary corner apartment with full kitchen and laundry facilities. Enjoy the luxury of extra space, class, convenience and secure inner city accommodation. Brand new appliances, carpets and drapes. Large balcony and light-filled living area with views in all directions over the Harbour and out to the Gulf. FREE UNLIMITED WIFI! Sky TV - movies and sports - is available in the both the living area and the master bedroom. The north facing master bedroom has a brand new bed, flat screen TV, and workspace. The ensuite bathroom has separate shower and bath. Ranch sliders open on to the large balcony overlooking the Harbour. Loads of handy wardrobe space. 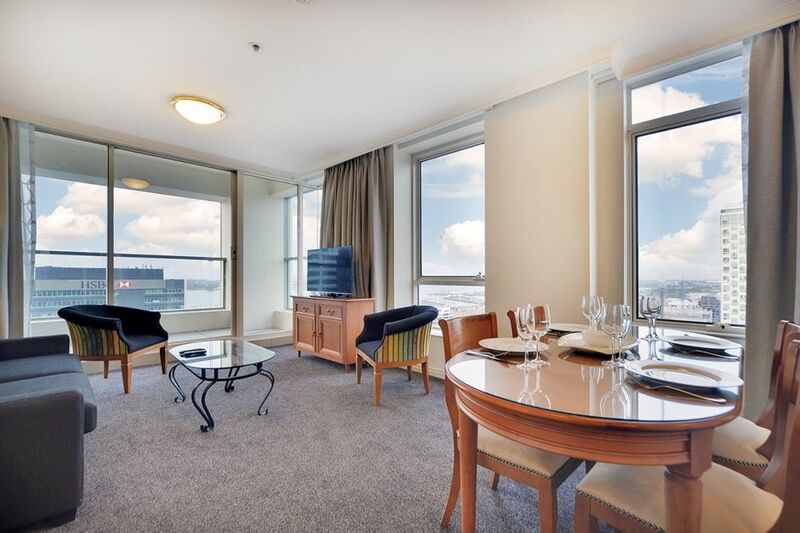 The second bedroom includes a desk, a large wardrobe and looks out to the Sky Tower and Auckland cityscape. The main bathroom has a shower, vanity and toilet. The apartment is located in a building with a mix of serviced apartments and residences with extensive facilities, including on-site dining for drinks, coffee, and meals. The Building has elevators and features a stunning light filled entrance lobby with a large meeting area. Instant access to Auckland city and all it's attractions as soon as you step out the door. The prices listed here are great value - they include cleaning, linen and towels, welcome tea, coffee, sugar and milk, conditioning shampoo, and hand and shower wash in the bathroom. Unpack your suitcase and you're ready to go! An on-site, secure car park is available for NZ$30.00 per night. If you require the car park, please tell us when you make your enquiry, so that we can add the car park to your booking before you make your payment. Location, luxury and security with amazing views. Spacious and newly renovated, with use of indoor heated pool, spa, sauna and gym. Auckland city is at your front door. A short stroll to Queen St shopping and events venues. Fine dining and walking along the stunning waterfront. Ferry, train and bus close by. Panoramic views of Auckland's Waitemata Harbour, from the Harbour Bridge across North Head and Rangitoto Island to the Hauraki Gulf. On-site, secure parking can be provided for $30 per night. Subject to availability. Full size oven with 4 hob ceramic cook top. Sachets of tea, coffee, sugar and milk. Well stocked with crockery, cutlery, and pots and pans and utensils. With views over Waitemata Harbour. Clean, comfortable apartment in excellent location to CBD! I was lucky to flind a week that was available on short notice. It was quiet even with all the construction goin on in Auckland. The convenience of walking to the Ferry building, AT Auckland metro train, market, shops and restaurants was perfect. The floor to ceiling windows gave the apartment an airy feeling...well ventilated, light and bright. The black out drapes made it great for sleeping. I hope it will be available next time I’m in Auckland. Thanks to the owner and Lisa who let us in. This was an excellent apartment, as per the photos on line. It was clean and spacious, the bed was comfortable, their airconditioning was good, the kitchen was well-equipped. The host was very helpful. Only issue was that construction in the neighbouring buildings and roadway made it rather noisy during the day. Auckland is building like crazy! This unit in the central business district (and a short walk to the wharf) is well appointed. Every appliance you need to cook is provided in the kitchen. There is slight noise (inside) from the construction of a huge building across the street. It did not affect our sleep, but using the patio, which we did not do, would not be relaxing. The contact person was personable and knowledgeable about the area. She was able to guide us to the places we asked. I recommend this apartment & would stay here again. My husband and I stayed here while on vacation in Auckland and couldn’t have been more pleased!! Stunning apartment with excellent views. The location couldn’t have been better just a couple of blocks to the wharf and ferry and walking distances to museums, etc. The apartment was spotless, beautifully decorated, and had all of the amenities needed for a great stay. The owner and site manager were easy to reach and very helpful. We travel internationally multiple times a year and prefer apartments to hotels and I have to say this is absolutely the place we will stay the next time we are in Auckland!!!! Premiere location in the heart of downtown Auckland. Short stroll to Spark Arena to watch your favourite artist. Catch the train to Eden Park for the next big event. Take the ferry to Waiheke Island and enjoy a Winery Tour. Explore the high quality shopping along Queen Street. Enjoy the fabulous dining and walks along the waterfront, Wynyard Quarter and Viaduct Harbour - the base for the Americas Cup and Volvo Around the World Racing yachts. Something for everyone!